Embarcadero® AppAnalytics is the first analytics service for mobile, desktop, and wearables. Understand your end users, wherever they are, to deliver better apps and experiences. Track and measure how often apps are used, which platforms they are running, what features customers are using, find and log crashes and more. Understand user behavior by capturing anonymous usage stats from end users. AppAnalytics is an analytics and tracking service, hosted by Embarcadero Technologies and available for RAD Studio XE8, C++Builder XE8 and Delphi XE8. 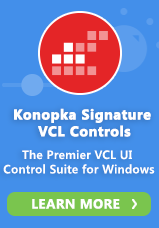 Understand users today in existing Windows VCL apps, FireMonkey mobile and desktop apps to deliver better solutions.